How come we don’t have more Jewish action heroes in popular culture? 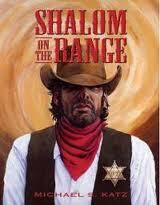 I started wondering about that when I posted my recent interview with Michael Katz about his book “Shalom on the Range” – a Western with a Jewish hero. Actually, I also wondered about it a few months ago after reading an interview with Michael Chabon regarding his (really good) novel “Gentlemen of the Road,” which concerns a pair of Jewish adventurers around 950 A.D.
For a while, Chabon’s book had the working title “Jews With Swords.” When he’d mention that to people, their reaction was frequently to laugh at the incongruity of the concept. And yet, there’s nothing incongruous about the concept. For better or worse, Jews – like pretty much every culture in human history – went through a time when they ran around getting in sword fights. It’s what people did before guns were invented. And it’s not like there’s any shortage of real-life Jewish badasses to serve as inspirations in the modern age.